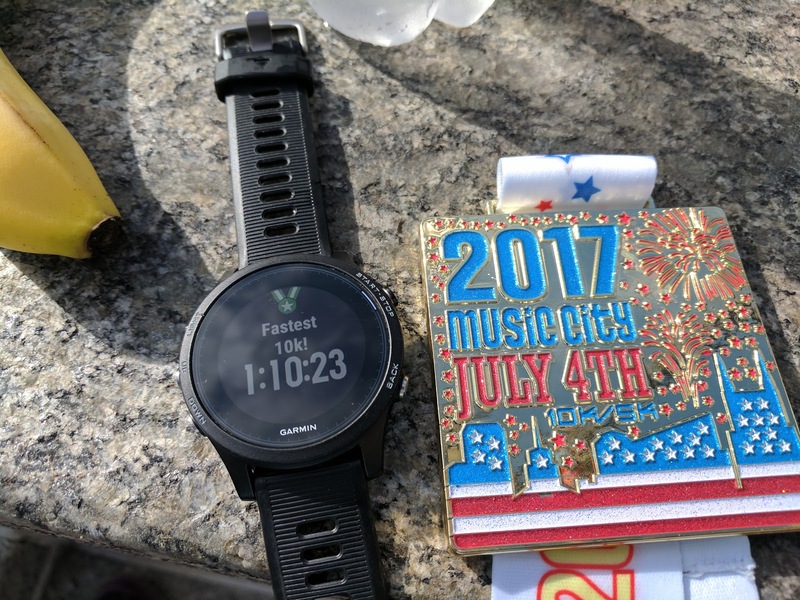 Music City July 4th 5k/10k put on by What Do You Run For? I have done this race many times and while I could park elsewhere, I'm pretty used to parking in the Public Square Parking garage just across the street from the square with the race booths set up. I did the same thing this year. This year, we started at 7 AM instead of 8 AM. Which I'm all for, even though it meant I had to get up at 5 AM. It rained a lot the days and night before the run, but during the run, it was pretty nice. We lucked out on the temp, with it only in the mid-70s. The humidity was pretty high, but that's to be expected in Nashville, TN, on July 4. They started the 5k and 10k together. The course is a single 5k loop that the 10kers do twice. I got my race packet (shirt, race number, and a drawstring backpack) and ran back to my truck to leave the shirt and grab my handheld water bottle. I debated taking the handheld. Water stations were supposed to be around mile 1 and mile 2 and I assumed there would be one at the finish/start of the second loop. And while humid, it was a good 10-12° cooler than expected. Finally, I decided to take my own water bottle. I saw several picture opportunities during the race that I would like to have, but I was going for a PR and decided not to pause for pictures. I ended up at the start line just in time, but then the race didn't start for 11 more minutes. I was probably pretty annoying to my neighbors as I just couldn't stand still and bounced around like a ping pong ball. I remembered to take a gel before the start. Another pet peeve was people playing music through their phone speakers. Like I want to hear your music! I don't! If I want music, I'll pop my earbuds in and listen to my own tunes. It's one thing to do that on a solitary long run with nobody about or just the occasional person to pass, but in a crowded 5/10k start? As I approached the first water stop around mile 1, there was a line and the volunteers were frantically pouring cups. I took a sip from my handheld and bypassed the water table. Mile 1 dinged at 11:25. A little faster than my projected 11:45 to hit a PR, but I knew there were more hills ahead. We circled Nissan Stadium and crossed over the Cumberland River. The approach was an uphill, so I ran partway up, then walked until the crest and picked up running again. The second mile had more downhill than uphill and that mile took me 11:24. Way to keep a steady pace, I thought, but can I keep it up? We turned on 5th Avenue and ran past the Country Music Hall of Fame toward the Bridgestone Arena. Fortunately, we were only on 5th Ave for a block because it was HOT. No breeze and just gross. I was really happy to get out to a breeze again. The second water station was around mile 2.3. Again, it was pretty busy, so I took another couple sips from my water bottle and passed it by. I had been taking a few sips here and there and had some water left. I knew I'd be taking a gel in soon and I always take water with my gel. Just before the turn onto Union Street and into the downhill before the 1/2 way mark, I took my second gel. A tad early, but I knew I wanted to be able to concentrate on the downhill and not be distracted by a gel. I took a few good swallows of water with the gel and headed down the hill. Mile 3 passed with an 11:28 pace. Ok, slipping a little. but still pretty close to the other miles. At the halfway mark, I manually pressed my lap key and noted the time for the 5k. 35:57. So this is a little embarrassing. I saw that time and I was not happy! My goal time for this race was 1 hour 13 minutes. So the halfway mark would have been 36:30. I was 33 seconds ahead at the halfway mark. 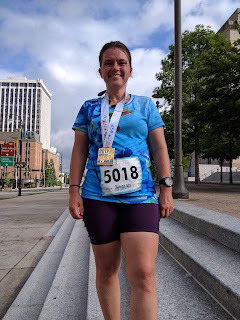 But for some reason, my brain thought it was 37:57, which if I could keep pace and not go slower, would still push me to almost 1 hour 16 minutes, which would not be a PR. So I was annoyed at the half-way mark because I thought I was doing so well (I was) but [I thought] my watch said I was slower than I thought I was. If I'd had more wits about me, I would have realized I couldn't be running an 11:25/mi pace for the first 5k and still be slower than my target pace of 11:45. Just brain not working right, I guess. I'm not really into quitting, so I didn't just stop or slow down or just say forget it. I kept running. I ran up the little rise to the first bridge crossing, fully expecting to see the halfway water stop. And nada. No water stop! Wow. I was super glad I hadn't drained my water bottle at the last gel. I was pretty low, but I had some more water. I went into cruise mode, running downhill, letting gravity and my leg turnover pull me down the hill and past 6 or 8 runners that were walking or running slower than me. It wasn't a big downhill, but I'll take advantage of every bit of downward slope I can! I finally felt like I was settling into my run. I am not really a good short distance runner. Anything under 3 miles and I never really settle in. There were a lot fewer people around me. I began to run the tangents and running where I needed/wanted to without having to worry about running into people or getting in somebody else's way. I popped one of my bluetooth earbuds in and pressed the play button. Nothing. I had prepped my music before the run, so I should have been able to just press play and get my running playlist. I turned off the earbuds and heard the little disconnect tone. Then turned them back on. And didn't hear a tone. Nothing. My heart sank and I got really annoyed when I realized they weren't coming on. Even though I'd put them on the charger the night before, they must be dead. I'd been counting on my music to help push me through the last half of the race and keep my tempo up for that PR that I thought was already in jeopardy, if not completely toast. On long runs, I carry a spare set of basic (non-bluetooth) earbuds for just such an occasion, but I'd left those in my duffel bag in my truck. No recourse. Nothing to do but just...run. So I ran. I made it to the mile 1 (mile 4.1) water station. This time there were plenty of cups ready to grab and only one other runner in the vicinity. Since I was low on water, I would have stood in line anyway. I needed the water. I grabbed the cup and kept walking while drinking and took off running the minute I was done. Mile one of the second lap done in 10:42. Wait, what?? That's a bit faster than my 5k PR pace. It helped that I was able to cruise down the hill at my own pace and not dodge other runners like I had to do in the first mile. As I approached the 2nd Cumberland River crossing on this lap, I counted the light poles to the crest of the bridge before it leveled out. 8 or 9. So I ran to the 4th one (passing a lady walking the hill). I glanced behind me and saw a pack of runners just past the water station. Wow. I'm not used to seeing many people behind me! I turned back to the job at hand and walked briskly up to the top and picked up running again. The lady I passed also began running when I did and I matched strides with her for about a minute before pulling away. Not sure if I sped up or she slowed down, but when the downhill hit, I went into cruise mode and off I went. So glad I practice running downhill! Mile 2 of the second lap was done in 11:07. Slower than my previous mile, but still faster than any of the miles in the first lap. I took my last gel here. I debated taking another gel so close to the finish, but I decided it wasn't a bad idea and it might kick in by the last 1/4 mile. At the very least, it would keep me from crashing at the finish before I could get more food into me. I got another drink at the last water stop and thanked the volunteers. I was a little tired at this point and could feel my legs getting heavy, but I only had about 3/4 mile left, so picked up the pace after I was done with my water. After a couple more mild hill climbs, I rounded the corner and headed down the home stretch. I felt my watch vibrate to indicate the last full mile but I didn't bother glancing down to see the split time. I could see the finish line and hear the announcer. A lady was coming up behind me with a pacer friend. The pacer said something like "go on, you can do this" and I have NO idea who he was talking to, but I took it to be me and started running faster. :-D.
The finish clock showed 1:11:11. I wanted to hit under 1:12:00! 1:12:00 would be a PR in itself and I knew my chip time was less than gun time. I ran and made it in 1:11:50 gun time. :-) Whoo-hooo!! My chip time was 1:10:20! A good solid PR from my previous record of 1:14:30 set in 2012 at the Hendersonville Classic on Memorial Day. I didn't realize until I was analyzing my watch data that I'd inadvertently added 2 minutes to my half-way time when doing math to determine if I was on track for a PR. I'm really glad I didn't just phone it in the last half because that almost certainly would have meant no PR. I got my medal, a bottle of water, and a banana and headed to my truck. I drank the water, dropped my bib, medal, and handheld off at the truck and headed back outside munching on the banana. There was a Starbucks a few blocks away, so I ordered a Frappuccino from the app and walked to get it. Coming back, I realized that using the parking garage pay station and elevator furthest away from the race venue was actually pretty nice and no waiting. Pretty happy with this race and my PR. I set out and trained to PR this race and got it done. Admittedly, the weather helped. A LOT. Humid, yes, but 10° less than expected and some cloud cover is a big help. My 10k training started back in April just after the Bridge Street Half Marathon. I decided to run a lot of easy miles and a lot of trail miles. I used HR and breathing to determine if I was running easy or not. I also tried to add in a lot of elevation. I did run some negative split runs and some speed interval runs, especially in the last 6 weeks of training. Interestingly enough (to me), my elevation for 10k training was only 4,000 feet less than when I trained for the Chattanooga Marathon. I think hill work, at least in small doses, agrees with me. I did have a little issue with my left arch giving me some trouble during this training cycle. I'm going to have to step up my strength exercises and make sure I don't let that turn into a big issue. I've been training for the Iron Horse Half Marathon for the last 4 or 5 weeks. The overlap with 10k training was a little weird and not something I really want to repeat. I probably ran more the last 3 weeks of 10k training than I normally would have because I was also training for the half marathon so I could leap into the Hansons Half Marathon training in week 5. But they were easy miles and it's hard to argue with a 4 minute 10 second PR. But starting next week, I can "just" train for the half marathon.